Everywhere you look, new smart home technology seems to be popping up. Security cameras that can tell if it is a family member or friend and UPS delivery man from the neighbor’s dog, door locks that only need a smartphone to unlock them and thermostats that can adjust themselves to keep you comfortable all day and night are just a few of the most popular offerings in this segment, but there’s another piece of tech that’s gaining in popularity: the video doorbell. 1. You’ll always know who’s coming and going.Anyone with kids, especially tweens and teens, knows the pain of having people running in and out of the house constantly. It’s bad enough when you’re home, but who’s coming and going when you’re not home? Sure, your daughter said that she was studying with Jessica tonight while you’re working late, but did she really invite Tommy over instead? Now you’ll know, and have a video record, of who’s been knocking at the door. 2. No more running to the door for false alarms.Whether you have overly-enthusiastic pets or are simply waiting for party guests while grilling on your back deck, running back and forth to the front door is exhausting. Stop doing that. A video doorbell lets you relax in the knowledge that your actual, real guests will chime in when they’ve arrived, so you can tell them to come around back or that you’re coming and will be at the door soon. You can give Fido the night off, if he’ll take it. 3. Less stress in those “just in case” moments.Everybody’s had one of those days when they’re running a bit late to meet someone at home, be it a salesperson, a friend or a family member. They’re left standing on the porch, wondering what to do next while you’re driving frantically in the hopes you’ll reach home before they leave. 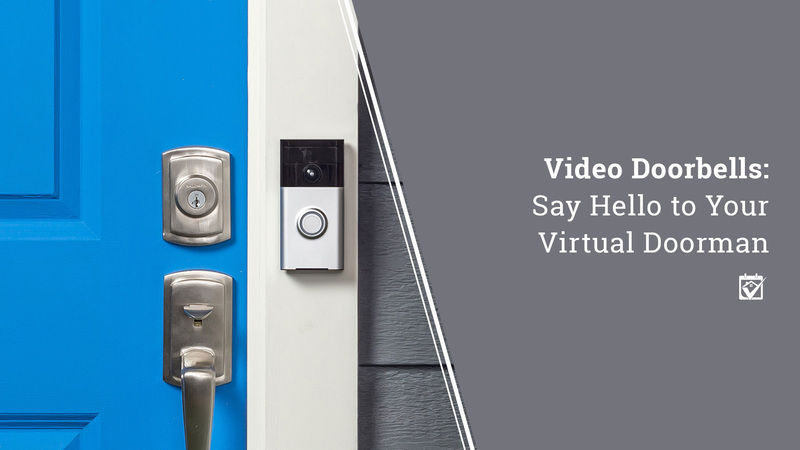 Save yourself and the other drivers on the road — the video doorbell will give you a way to let your visitor (or child who forgot their keys again) know that you’re on your way and will be there very soon. Remember, safety first. Nest – Hello Smart Wi-Fi Video Doorbell. $229.99.Currently in pre-order, this is the first Nest-native video doorbell, meant to mesh seamlessly with the new Nest security suite and the Nest Learning Thermostats. It utilizes the Nest IQ software to identify friends and family, records all day and all night long in high definition and has a 160 degree diagonal field of view. You’ll have to have an existing doorbell to power this model, however.